Released in 1981 Cannibal Ferox, which also goes under the title Make Them Die Slowly is a film from another time and place. Only in the 70s and early part of the 80s could a movie like this be made and released. At the time of the release Italian films were starting to become mostly knockoff films of either American or other Italian films and not long after this Italian cinema would slowly start to fade. Cannibal Ferox is obviously inspired by Ruggero Deodato’s infamous Cannibal Holocaust, which is probably the holy grail of the cannibal film; prior to this movie Lenzi would release Eaten Alive, which featured gore scenes from Deodato’s Jungle Holocaust, but oddly enough it was actually Umberto Lenzi who got the ball rolling with this style of films with Man from Deep River, which was originally released in 1972. By the time 1981 rolled around exploitation flicks were starting to fade away in favor of slasher flicks, which would dominate the 80s and while after this exploitation films were still being produced the tide was starting to turn on them and by the mid-80s there were plenty of them still around, but not like they used to be. I suppose one can label Cannibal Ferox the poor man’s Cannibal Holocaust, but despite Ferox still works well and while it may not be as good as the film it tries to be like I’ll be honest when I say I kind of like both films about the same and much even prefer this over Cannibal Holocaust; I also happened to see Cannibal Ferox first so I suppose that could play a part in why I slightly prefer this one. Let’s be honest when it comes to Italian horror cinema these films were never about the writing, but with that said there are plenty of well written horror flicks to come out of Italy, but it was much more about the visuals or violence. More often than not common sense sort of goes out the window and these films often had poor screenplays, but they still had a certain charm going for them. 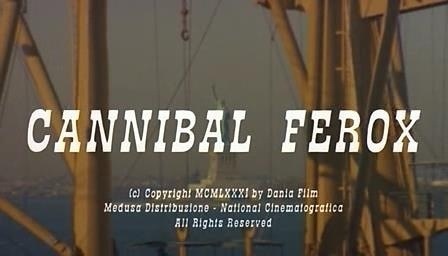 With Ferox, Umberto Lenzi does nothing to dispel that notion, but however I found Lenzi’s script rather interesting and entertaining despite taking elements from Cannibal Holocaust and offering nothing to really separate it from that movie I still again found the script rather interesting. Some people talked about the social commentary in the movie, but I don’t really think there was any since any social comments in the film were lifted from Cannibal Holocaust so therefore this is just a balls to the wall exploitation flick. The characters were actually fairly interesting and while they may not be the most developed characters they do however have their own identities and some of the characters are sympathetic and others like Mike Logan (Morghen) are rather ruthless and vile. The subplot revolving around mobsters in New York City ties in with Mike Logan, but it doesn’t really impact the story and it only seems to be there to simply add to the running time and while these scenes don’t hurt the movie had they been removed nothing would feel like it was missing. The screenplay is far from great, but for an exploitation flick from the early 80s, Lenzi actually does a fairly good job. I’m not really an expert on Umberto Lenzi since most of the films I’ve seen by him are from the 80s when he started to become more of a knockoff director and while I wouldn’t rate him as one of my all-time favorite filmmakers I have mostly enjoyed his work. 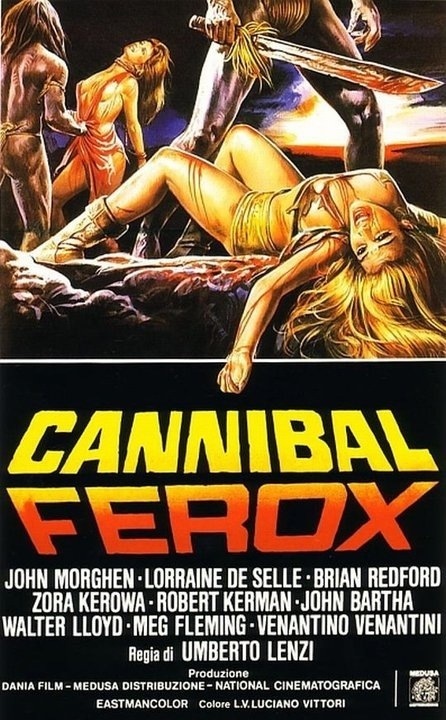 Cannibal Ferox in my opinion would probably be his best film of the ones I’ve seen. The action is spread out, but mostly contained to the 2nd half, but the pacing was still pretty good due to the gritty and nasty feel of the movie. Even though this film again very much follows Cannibal Holocaust I think this is one of the few knockoff films that’s just as good as the film it was inspired by. This one might lack the social commentary of Cannibal Holocaust, but it works on being a really dark and twisted movie that really makes you feel dirty after watching it. You know you’ve seen one too many of these movies when you pretty much know who all the actors are; Lorraine De Selle is excellent as always as is Zora Kerova (as Zora Kerowa). The standout however is Giovanni Lombardo Radice who uses the name John Morghen, which is an alias he often used when doing these kinda flicks. Radice is rather sadistic and evil and the performance was excellent. The acting may not exactly be Oscar worthy, but for a low budget Italian exploitation flick the acting is actually pretty good; Robert Kerman who starred in Cannibal Holocaust has a small role here as Lt. Rizzo and like always he’s fun to watch. Cannibal Ferox is extremely graphic and even though I’ve seen plenty of films like this I’ll admit several scenes even had me cringing and the gore F/X are excellent as well. We have not 1, but 2 castrations, an eyeball being cut out, scalping’s, body parts chopped off and one of the most memorable hooks through the breasts. The reputation Cannibal Ferox has is very deserving and it’s one of the more graphic movies of its era. Slasher flicks of the 80s often came under fire for their violence, but most of those movies are PG-13 when compared to Cannibal Ferox. Overall Cannibal Ferox is an excellent flick and even though it totally rips off Cannibal Holocaust I still felt this movie was every bit as good. Ferox receives mixed reactions from viewers, but I think it’s an excellent movie that is dark, gritty and disturbing and while it may not have any real social commentary it works on being flat out disturbing. A lot of the negative reviews stem from the animal killings and while I don’t agree with the killing of animals for shock value, but if you can look past that I think you’ll see Ferox is actually a pretty good flick. In one scene Giovanni Lombardo Radice’s character is supposed to kill a pig, but Radice refused to do it and walked off set and a stand-in had to be used instead.